There are three major habitat attributes—size, integrity, and quality—that have to be considered for the conservation of elephant populations. The minimum viable habitat area is related to the minimum viable population and the carrying capacity of the habitat (the density of elephants under so-called equilibrium conditions). An equilibrium density of 0.5 elephant/km2, typical of many dry habitats in Asia, would indicate minimum habitat areas of 2,0006,000 km for long-term persistence of a population. If carrying capacity is more likely to be 0.1 elephant/km , such as for a tropical rain forest, the mini mum area needed increases fivefold over the above figures. The Armbruster-Lande model for African elephants in semiarid habitats arrived at a reserve size of 2,500 km , assuming an equilibrium density of 1.2 elephants/km and 3,000 elephants as the MVP for long-term persistence (fig. 9.1). None of these take home range sizes of elephant herds or clans and their overlap into consideration. It is implied that range sizes are incorporated into figures of equilibrium elephant density. 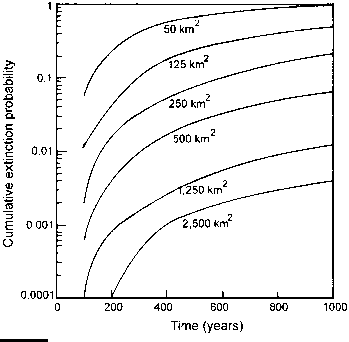 Home range sizes of elephant populations vary over two orders of magnitude (chapter 4). Over large landscapes, there could be considerable heterogeneity in elephant usage, densities, and range sizes. All these have to be factored into planning on the ground for viable habitat areas for elephants. recovery when favorable conditions return. Even if observed home range sizes of elephant herds or clans are small now, a long-term perspective requires that larger integral landscapes be maintained. The well-known "theory of island biogeography," elaborated by Robert MacArthur and Edward Wilson in 1967, is being increasingly applied to insular habitats. 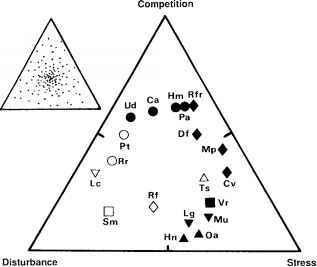 Empirical relationships between area and vertebrate species richness in islands submerged since the late Pleistocene suggest considerable species losses in smaller islands. Thus, reductions in the faunal richness of insular reserves have been predicted in the absence of management. John Terborgh has pointed out that, in insular habitats, the species most vulnerable to extinction are those with lower reproductive rates and those at the summit of food chains. Although insular biogeography theory allows for migration and recolo-nization of habitats in which extinctions have occurred, this would rarely be possible for elephant populations living amid landscapes drastically altered by humans. Fragmentation and insularization are usually irreversible in today's world. Relatively large, interconnected landscapes are still available for elephants in central Africa and parts of eastern and southern Africa even if sections of these may be devoid of elephants today. Western Africa presents a very different picture with its highly fragmented landscape. Asian elephant landscapes are also highly fragmented, although somewhat less than in western Africa. Several contiguous landscapes of over 10,000 km are still available in countries such as India, Myanmar (Burma) and its border with Thailand, and perhaps Sumatra. When landscapes are threatened with fragmentation, a system of corridors may be one practical way to ensure connectivity for elephant movement. 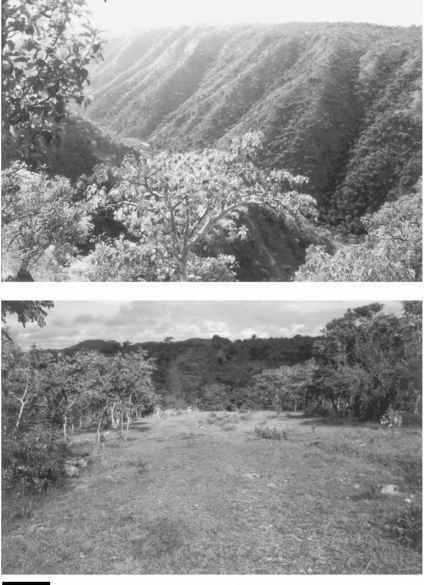 A corridor may be defined in simple terms as a relatively narrow strip of habitat that provides a passage for the target species to move between two larger expanses of habitat (fig. 9.2). The dimensions of a corridor, its location in the broader landscape, and its vegetation attributes are important to its success. For elephants, a corridor that is 0.1 km wide and 10 km long is obviously a very impractical one. One that is 1 km wide and 10 km long may do the job of ensuring some gene flow, but such a long passage would still entail a high risk of conflict with human settlements and agriculture along the interface. Field observations in India show that passages 0.5-1 km wide and less than about 5 km long are regularly used by both bulls and family herds. Narrower passages or those with greater length-to-breadth ratios may still be used by some bulls. Narrow corridors situated in the plains are more likely to be traversed than those along steep hill slopes. Because corridors act as funnels for elephants moving between more expansive habitats, there could be a higher incidence of conflict with people along the boundary. The boundaries of a corridor thus may have to be protected (section 9.3). If the objective of a corridor is merely to act as a passage for elephants, it would be better to maintain the vegetation in a state that encourages rapid movement rather than a prolonged stay that could promote conflict. A corridor for facilitating the movement of elephants to the north of this gorge (top) was created in 2001 through land acquisition (bottom) in the Bandipur National Park, India. This corridor links the western and eastern parts of the largest Asian elephant population's range, the Nilgiri-Eastern Ghats Range in southern India. Finally, a point has to be made about the location of the potential corridor within the overall landscape. In some instances, a narrow passage may connect an expansive range with a small habitat patch along the periphery of the landscape. Elephants moving through this passage into the small patch may actually come into serious conflict with surrounding cultivation. The pragmatic option here would be to sever the passage and prevent elephants from utilizing the small patch, which might only be an insignificant proportion of the overall home range of the elephant group. An otherwise large landscape may also be fragmented in functional terms by structures such as roads, railway tracks, dams, and associated canals or pipelines, such as in many parts of India (fig. 9.3). The impediments to animal movement could be partly avoided through appropriate engineering design at the time of construction. Roads across hilly terrain cannot be crossed along stretches lined by steep sides, but can be negotiated where contours are more gentle. Easy passage should be provided at points along identified animal paths. Elephants may not traverse reservoirs with a very wide waterspread even though they are actually excellent swimmers, but shorter expanses may be crossed regularly, such as in southern India's Periyar reservoir. Canals have had mixed impacts on elephant movement. The Tunakadavu-Sircarapathy canal in the Anamalais has proved to be a death trap for elephants trying to swim across. Some animals have been swept away by the swift-flowing waters into narrow, steep-sided stretches, where they drown or end up at the entry to a tunnel. There has been mixed success in rescuing trapped elephants. Sections of the canal are below ground and do not impede movement. The unpaved, 6-km long Moyar Canal in Mudumalai Sanctuary can be crossed by elephants at several places. The 10-km long Chila-Motichur Canal in Rajaji National Park is paved with concrete; hence, elephants do not venture to swim across. A.J.T. Johnsingh, who has been monitoring the movement of elephants there, observes that only solitary bulls occasionally cross a narrow bridge along the canal, but never the family herds. He believes that herds avoid crossing the bridge because of human disturbances in the surrounding area. In other situations, however, a broader bridge with an earthen surface may be needed to encourage family groups, suspicious of artificial structures, to use it. Penstock pipes carrying water from a hilltop reservoir downslope to a power-generating plant at several places in the Nilgiris, Anamalais, and Periyar in the Western Ghats obstruct the movement of elephants completely. Possible solutions for such structures would be to bury the pipes underground, at least along certain stretches, or excavate a passage beneath the pipes along elephant paths. It is difficult to generalize about maintenance of habitat quality for elephants because they range over such diverse habitats. If available, it is best to maintain a mosaic of vegetation types. Studies of foraging ecology indicate that elephants show distinct seasonal preferences for particular habitat types. 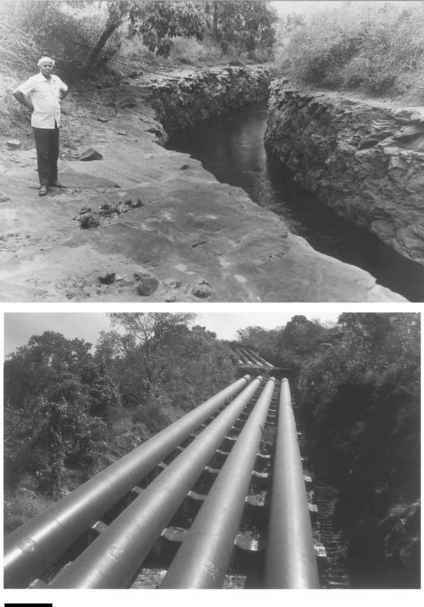 Open-cut canals (top) such as in the Anamalais or (bottom) pipelines in many parts of Western Ghats in southern India hinder the free movement of elephants. Elephants distinctly prefer secondary forests over primary forests (chapter 8), but this need not be justification for deliberately manipulating primary forests unless there is a very strong need for an artificial increase in carrying capacity to maintain a viable population. Tropical moist forests are unique in their rich biodiversity, which is destroyed through large-scale manipulation. Disturbance also allows alien invasive plants and animals to become established, thereby reducing their biodiversity value. In tropical dry forests, the elephants themselves ensure a high carrying capacity through their mode of feeding on woody plants. The quality of surface water is also an important attribute of habitat quality, especially when it is likely to be contaminated with parasites/pathogens from other wildlife or livestock, pesticides from nearby agricultural areas, heavy metals and other impurities from mining activities, or untreated sewage from cities and towns. One study by R. K. Singh and S. Chowdhury (1999) on elephant use of riverine habitat in the heavily mined Singhbhum region of central India found significant avoidance of stretches with unregulated mine discharge. They suggest that waste levels in water should be kept below 200 mg/L (total suspended solids, TSS) and 60 NTU (nephelometric turbidity units; turbidity) for it to be fit for consumption by elephants and other wildlife. Taking all these factors into consideration, the more appropriate approach to making elephant conservation compatible with biodiversity conservation is perhaps the "ecosystem viability analysis" that David Western has advocated.